For the divisions of New York City that are coterminous with its counties, see Boroughs of New York City. There are 62 counties in the state of New York. The original twelve counties were created immediately after the British takeover of the Dutch colony of New Amsterdam, although two of these counties have since been abolished. 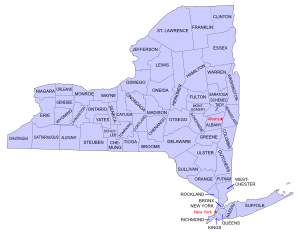 The most recent county formation in New York was in 1914, when Bronx County was created from the portions of New York City that had been annexed from Westchester County in the late 19th century and added to New York County. New York's counties are named for a variety of Native American words; British provinces, counties, cities, and royalty; early American statesmen and military personnel; and New York State politicians. The FIPS county code is the five-digit Federal Information Processing Standard (FIPS) code which uniquely identifies counties and county equivalents in the United States. The three-digit number is unique to each individual county within a state, but to be unique within the entire United States, it must be prefixed by the state code. This means that, for example, while Albany County is 001, Addison County, Vermont, and Alachua County, Florida, are also 001. To uniquely identify Albany County, New York, one must use the state code of 36 plus the county code of 001; therefore, the unique nationwide identifier for Albany County, New York, is 36001. The links in the column FIPS County Code are to the Census Bureau Info page for that county. 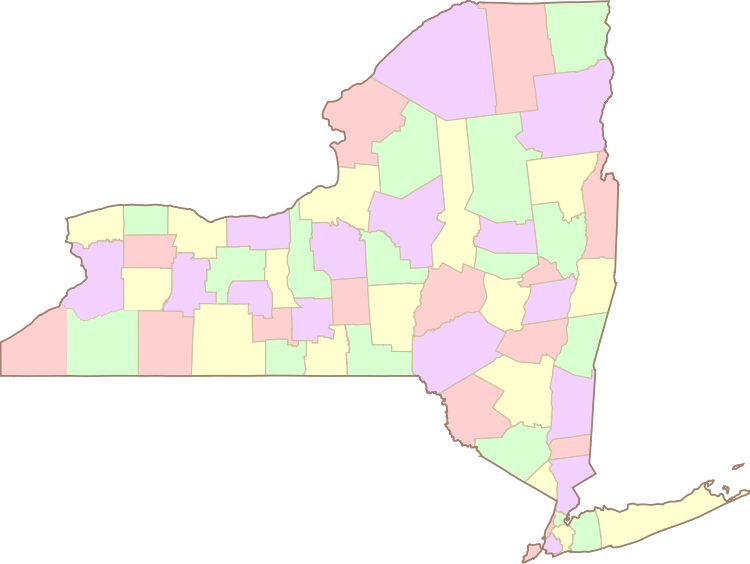 Five of New York's counties are each coextensive with New York City's five boroughs and do not have county governments. They are New York County (Manhattan), Kings County (Brooklyn), Bronx County (The Bronx), Richmond County (Staten Island), and Queens County (Queens). The Bronx County Courthouse and the borough's main post office are located in the South Bronx. There is no longer a separate Bronx Borough Hall. Brooklyn Borough Hall, the Federal Building and Post Office, and county Supreme Court are in Downtown Brooklyn. The Municipal Building, where the Manhattan Borough President's office is located, and most courthouses are in the downtown Civic Center. The General Post Office is in Midtown Manhattan. Queens Borough Hall and a courthouse are in Kew Gardens. Another major courthouse, post office, and the Long Island Railroad hub are in Jamaica. Queens also has general post offices in Flushing, Long Island City and Far Rockaway. Staten Island Borough Hall, three courthouses, and the St. George Terminal transportation hub are in the St. George neighborhood. Brookhaven County Would hypothetically consist of the existing Town of Brookhaven, New York in Suffolk County on Long Island. Peconic County Would hypothetically consist of the five easternmost towns in Suffolk County on Long Island. Salmon County Would hypothetically consist of the eastern half of Oswego County. ^ a b c d e "New York Formation Maps". Genealogy, Inc. Archived from the original on December 30, 2007. Retrieved 2008-01-20. ^ a b Beatty, Michael (2001). County Name Origins of the United States. McFarland Press. ISBN 0-7864-1025-6. ^ a b "EPA County FIPS Code Listing". US Environmental Protection Agency. Archived from the original on 2012-10-08. Retrieved 2007-07-24. ^ Benjamin, Gerald; Nathan, Richard P. (1990). Regionalism and realism: A Study of Government in the New York Metropolitan Area. Brookings Institution. p. 59. ^ a b c d "Find A County". National Association of Counties. Archived from the original on August 4, 2010. Retrieved August 9, 2010. ^ Legislation splitting off Bronx County from New York County was enacted in 1912 with an effective date of January 1, 1914. Prior to 1874 the entire area had been part of Westchester County. See McCarthy, Thomas C. "A 5-Borough Centennial Preface for the Katharine Bement Davis Mini-History". New York City Department of Corrections. Retrieved 2008-01-25. ^ Lynch, Mike (2007-10-30). "North Elba Supervisor Candidate Debate". Plattsburgh Press Republican. Retrieved 2008-01-20. ^ Healy, Patrick (2004-02-11). "Growth Pains and Clout Heading East in Suffolk". The New York Times. Retrieved 2008-01-20.